Classical heroes inspired Americans through their achievements and examples, providing ideal models of behavior. Americans turned to Plutarch’s Lives for biographical character models (exempla virtutis), moral inspiration, and dramatic stories taken from history. Ancient figures as Solon, Pericles, Alexander, Cornelia, Cato the Elder, Cicero, Julius Caesar, Cleopatra, and Spartacus thus became broadly known in national discourse and lore. Hercules’ Choice is an ancient Greek myth admired by the Founders and later American generations. This allegory epitomizes Neoclassical ideals and their existential bearings. 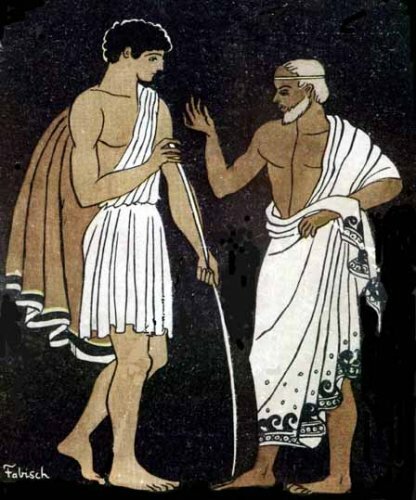 Homer’s Odysseus story of Telemachus and Mentor originates the widely employed concept of “mentor” and “mentoring. Where did George Washington, John Adams, Thomas Jefferson, and James Madison turn for character models, civic ideas, and inspiration? Not only to Plutarch but to a range of classical authors, often read in translation, including Cicero, Livy, Tacitus and Virgil. But Plutarch had unique influence. Because he was so widely read, the luminaries he wrote about became familiar, iconic, and referential figures to men and women of the 18th and 19th centuries. Plutarch’s reflections often included moral and psychological judgments. In an age before psychology, His biographies provided commonly admired moral examples and clues to human nature for public leaders and private citizens. They included stories of probity and vice, virtue and cowardice, liberty and tyranny. The Founders and others studied the lives of ancient lawmakers and statesmen in order to discover civic wisdom and the workings of just government. For American women, Cornelia's personal and civic virtue became a legend and role model. Cornelia, taking upon herself all the care of the household and the education of her children, approved herself so discreet a matron, so affectionate a mother, and so constant and noble-spirited a widow, that Tiberius seemed to all men to have done nothing unreasonable in choosing to die for such a woman; who, when King Ptolemy himself proffered her his crown, and would have married her, refused it, and chose rather to live a widow. In this state she continued, and lost all her children, except one daughter, who was married to Scipio the younger, and two sons, Tiberius and Caius, whose lives we are now writing. These she brought up with such care, that though they were without dispute in natural endowments and dispositions the first among the Romans of their time, yet they seemed to owe their virtues even more to their education than to their birth. When women friends questioned Cornelia about her simple dress and lack of personal adornment, simplicity unusual for a wealthy Roman woman of her rank, Cornelia pointed to and said of her sons, “These are my jewels." Caroline Winterer elaborates the story of Cornelia and Cornelia’s model role among leading women of the early American republic in The Mirror of Antiquity: American Women and the Classical Tradition, 1750-1900, Cornell, 2007. 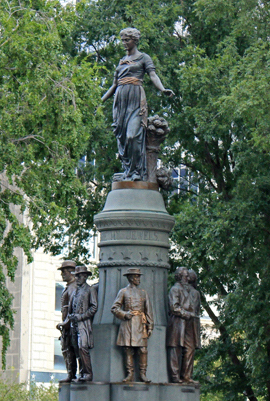 In front of the Ohio Statehouse in Columbus, an 1893 figure of Cornelia, personifying the state of Ohio, with arms wide spread, overlooks the state's native sons and "jewels," military and political leaders of the Union during and after the American Civil War: Ulysses S. Grant, Rutherford B. Hayes, James A. Garfield, Philip Henry Sheridan, Edwin McMasters Stanton, and Salmon P. Chase. Why did Cornelia become an embodiment of the “Roman matron” and a model of republican womanhood. Explain why several generations of Americans found Cornelia’s actions and mindset virtuous and worthy of imitation. How does this Civil War monument celebrate Cornelia, and through what allegorical means? In the first century B.C., Spartacus was the leader of the great Roman slave revolt. Spartacus managed to break through Roman forces, but after many battles was killed. Approximately 6,000 of Spartacus’s followers were crucified on the Appian Way. The Roman general Crassus never gave orders for the bodies to be taken down, thus travelers were forced to see the bodies for years after the final battle. In the 19th century, Spartacus became a symbol of freedom and a hero for the anti-slavery movement and republicans. Plutarch’s Spartacus story was well known to 19th-century Americans. Those who opposed slavery often considered Spartacus a symbol, hero and martyr. It was an enduring story. Spartacus was an acclaimed 1960 Stanley Kubrick movie. For further reading: Barry Strauss, The Spartacus War, Simon & Schuster, 2009, tells the Spartacus story in depth, and Brent D. Shaw’s Spartacus and the slave wars: a brief history with documents, Bedford, 2001. Why did Spartacus become a symbol of freedom and a hero for abolitionists and anti-royalists? A shortcut to riches is to subtract from our desires. Though boys throw stones at frogs in sport, the frogs do not die in sport but in earnest. Socrates thought: if all our misfortunes were laid in one common heap, whence every one must take an equal portion, most persons would be contented to take their own and depart. In human life there is a constant change of fortune; and it is unreasonable to expect an exemption from the common fate. Life itself decays, and all things are daily changing. The talkative listen to no one, for they are ever speaking. And the first evil that attends those who know not to be silent is that they hear nothing. He is a fool who leaves things close at hand to follow what is out of reach. The whole life of man is but a point of time; let us enjoy it, therefore, while it lasts, and not spend it to no purpose. What is a maxim? How is a maxim different from an instructive story, such the lessons in Aesop’s Fables? What lesson is to be learned from each of these maxims above? From these maxims, how would you describe Plutarch’s estimation of a good life? What worries does Plutarch sound on republican government? By implication, what warnings does Plutarch have for Americans today? 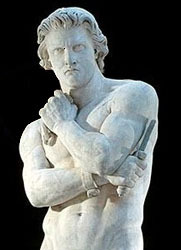 The moral allegory of Hercules’ Choice provides a straight thought-line from Renaissance humanism to the creation of the United States and its political symbols. Among classicists, it was one of the most beloved and inspiring tales of the 18th century. Hercules' Choice captures the opposing pulls of virtue and temptation. The moral tale had enduring interest for philosophers, political leaders, literary intellectuals, and artists through the Enlightenment, and it was a theme admired by the Founders. 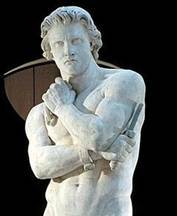 Hercules chose Virtue over Vice, making him a symbol of personal and civic good. 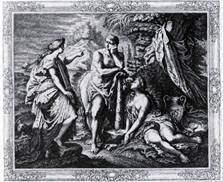 I proposed the Choice of Hercules, as engraved by Gribeline [above] in some Editions of Lord Shaftsbury’s Works. The Hero resting on his Clubb. Virtue pointing to her rugged Mountain, on one Hand, and perswading him to ascend. Sloth, glancing at her flowery Paths of Pleasure, wantonly reclining on the Ground, displaying the Charms both of her Eloquence and Person, to seduce him into Vice. John Adams invokes Hercules as a model for his own self-development. The note may be found in a diary entry, Jan. 1759, in L. H. Butterfield, ed., Diary and Autobiography of John Adams, vol. 1: Diaries 1755-1770, Belknap, 1962, 72 . Hercules, the son of Zeus, was marvelous to behold. Fire flashed from his eyes. So fearsome was the youth, he was sent to tend the cattle of his earth father, Amphitryon, on Mt. Cithaeron. But Hercules soon wandered off by himself. He left the herd and went into the wilderness. He came to a solitary crossroads where he sought to make sense of his future. Just at this moment, two women approached. One of them, Arete, is elegant and modest in her appearance and demeanor. She is dressed in white. The other, Kakia, is sensually dressed in a rainbow of colors. Kakia is more beautiful than Arete. "The whiteness of her skin is powdered and tinted. She carries herself so arrogantly that she seems taller than she is. She complacently regards herself with bright, vacant eyes, and then a moment later, she looks around to see if others are watching her, and often she gazes admiringly at her own shadow," says one old telling of the tale. Kakia crowded Arete to one side and ran toward Hercules: "Choose me," she said, "for I will guide you along an easy path. There is no pleasure you will not taste. No discomfort that you will avoid. The pleasures of the senses, they are yours without labor or effort." Kakia promises a life that is easy-going and entertaining. She promises Hercules enrichment. "What is your name?" Hercules asked. "My friends call me Happiness and Bliss (eudaemonia) but my foes, Idle Pleasure and Wicked (kakia),” said the seductress. Then Arete said to Hercules: "I too come to you. I know your parents, your gifts, and I am led to hope that you will choose a different road. I will not bribe you with sloth. The gods give nothing to those on earth without effort and toil. You must honor the gods, render the city services, you must become a benefactor." Arete promised Hercules a rough road of obstacles and ascents, but with the joys of life that had been gained as a result of hard work, contribution and service to others, and living in a strong, healthy body that serves the spirit. Arete turned on Kakia: "Miserable creature!" she exclaimed. "You do not know true pleasure. To prick your desire for food, you seek out resourceful cooks. To sharpen your urge to drink, you purchase costly wines. In summer your whim is for snow. No bed is soft enough for you. You spend the night in debauchery and the day in sleep. A sordid old age awaits your votaries, as does shame and regret, fear and faltering under the load of uncertainty and undone tasks. And you, an outcast among gods, an object of derision! You have never seen what gladdens the eye: good works!" Arete declares to Hercules that the gods never give good without suffering. Then Arete and Kakia vanish. So what does Hercules do? Hercules chooses Arete over Kakia. His preference is for challenge and "hard living." Hercules returns to Mount Cithaeron, where a wild animal was laying waste to his father’s flocks and to the shepherds in the countryside. The young hero -- Arete’s words still ringing in his ears -- arms himself, scales the wild, wooded mountain, overcomes the Nemean lion, flinging the skin over his shoulder and setting the gaping jaw on his head as a helmet. Hereupon, in legend and lore, Hercules becomes the champion of the oppressed. Hercules at the Crossroads is the source for phrases like high road and rocky road. When we speak of the primrose path, we are talking about Kakia’s flower-strewn road, the road to "pleasure," fleeting in its delights and gladness, a road that, according to the moral lesson, leads to ruin and remorse. At the end of Hercules’ climb may stand a Temple symbolizing Wisdom, or a winged horse, Pegasus, symbolizing Fame and Glory. Explain why Hercules’ Choice is an allegory of free will (libertas). What does the story suggest about or prescribe as public virtues (virtus)? To what degree and in what ways does the story reflect what Neoclassicism admired (gloria, fides, dignitas)? Hercules’ Choice acknowledges passion, desire, and appetite. How? What pictorial symbols are used to represent virtue and vice? Explore the many representations of Hercules’ Choice in painting and drawings. Identify symbols of Virtue (e.g., laurel, book, sword, owl) and Vice (e.g., masks, cards, mirror)? Why did this particular moral allegory impress Americans like John Adams? For more detail on the theme of Hercules’ Choice, see Karl Galinsky, Hercules Themes, Rowman and Littlefield, 1972. Mentor was the trusted friend and wise teacher in The Odyssey made legendary by François Fénelon. The concept of “mentor” has wide currency in American institutional life, and from the study of this story, students and teachers may obtain a firmer understanding of how it evolved and its enduring vitality in education. Explain how the word mentor is used today (both as a noun and verb). How does it compare and extend the classical story from Homer and François Fénelon’s tale of adventure and coming of age story? The Oxford English Dictionary defines mentor as "allusively, one who fulfils the office which the supposed Mentor fulfilled towards Telemachus. Hence, as common noun: An experienced and trusted adviser." The story of Mentor was embellished in Les aventures de Télémaque, by François Fénelon (1651-1715), written in 1699. Fénelon created the story of Telemachus and Mentor as it was known to the 18th and 19th century. For more detail on the content of Fénelon’s Telemachus and Mentor epic, with rich illustrations, see Emmanuel Schwartz, The Legacy of Homer, Dahesh Museum and École des Beaux-Arts, 2004.